I have grid N × M in which each cell is coloured with one colour. When the player clicks on any cell of the grid of colour α, the cell in the top-leftmost corner of the grid, of colour β, receives the colour α, but not only it: all those cells which are connected to the source by paths which use only the colours α or β also receive the colour α. The connection between cells should be considered only in the horizontal and vertical directions to form the paths. For example, when the player clicks on the cell highlighted in the figure to the left, the grid receives the colouring of the figure to the right. The goal of the game is to make the grid monochromatic. The first line of the input consists of 2 integers N and M (1 ≤ N ≤ 4, 1 ≤ M ≤ 5), which represent respectively the number of lines and the number of columns of the grid. The N lines following describe the initial configuration of the grid, representing each colour by an integer between 0 and 9. The input does not consist of any other line. Print a line containing a single integer that represents the minimum number of clicks that the player must do in order to make the grid monochromatic. I'm trying to find a solution with backtracking (Because of the time limit of 8 seconds and small size of the grid). But it is taking time limit exceeded. How can i make it faster ? //get the state of this solution... the cells are either their original colour, or the last selected colour. This is not C++. This is C. I suspect the only reason you label it as C++ code is because you needed to use a map. Don't use C-style headers. <cstdio> instead of <stdio.h>. Don't use <cstdio>, use <iostream>. Macros are bad. They give horrible error messages, don't follow scoping rules, and confuse the reader. a. What can MAX mean? What does INF mean? The casual observer will assume that these might refer to a max function and the IEEE infinity respectively, but they don't. Why signed_integer? Why not just int? It increases the verbosity of your program and confuses the reader. Terrible variable names. n, m, mink and vst convey zero meaning. Don't use memset. Don't use memcpy, use std::copy. What if your types change, say instead of an array you now have a vector? Suddenly refactoring. Speaking of which, don't use raw arrays, use a vector. vst_states is used nowhere in your program. It's commented out. It's discouraged to have commented out (dead) code, so remove it. Let VCS do the job. Is cleanBuffer() a good function name? Considering you have a program that deals with filling and painting it's ambiguous. Actually, getchar_unlocked is non-standard and shouldn't be used at all. Types and Variables and Functions, oh my! Now we're safer and our Grid is copyable! We will take advantage of this fact. This makes your algorithm very difficult to understand as you keep referencing external variables to it. I barely know what any of these are for. Definitely signed_integer is an unnecessary typedef (since int is clearly signed already), and it's an interesting contrast in the verbosity for signed_int and your k, which is apparently the number of steps you've taken thus far. But instead you set a global variable. That makes it hard to understand. SIX arguments! That's a lot of arguments. But conceptually, we're painting the grid based on a single selection, so shouldn't there be just two arguments? What are all the others for? What is the return type? It's difficult to understand this function. When you separate out your concerns, that function above is easy to understand. You are checking if you're done based on the return value of your flood function which is named cont? That's most of the work right there - for each available color, pick one, increment the step count, and get a new grid. The nice thing is that now our entire actual algorithm is self-contained, no global variables, is just 26-lines of code including whitespace and comments. Note that the cells are either their original colour, or the last selected colour. 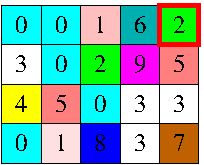 This means that we can represent the current state of the board by means of 20 bits (marking for each of the 4*5 cells whether they contain the original colour), and a number in the range 0 to 9 giving the last colour chosen. This results in a maximum of 10 million states to explore. The backtracking function can avoid having to recurse if it reaches a state that has already been visited. I would expect this change to make your solution considerably faster. Not the answer you're looking for? Browse other questions tagged c++ programming-challenge time-limit-exceeded backtracking or ask your own question.